We were ready to leave San Juan del Sur and move on to Costa Rica. We boarded a bus in SJDS headed for Rivas, although we weren’t going all the way to Rivas. We asked to be dropped at La Virgen, which is simply the intersection where the road to SJDS meets the Panamericana Highway. From there we would flag down pretty much any southbound bus that would get us to the border city of Penas Blancas. After waiting for a few minutes on the side of the road, a “collectivo” taxi stopped that had 2 seats available. These taxis will collect passengers until they have a full load and give everybody a break by sharing the fare. He offered to get us to the border for a little less than $5.00 so we took it. 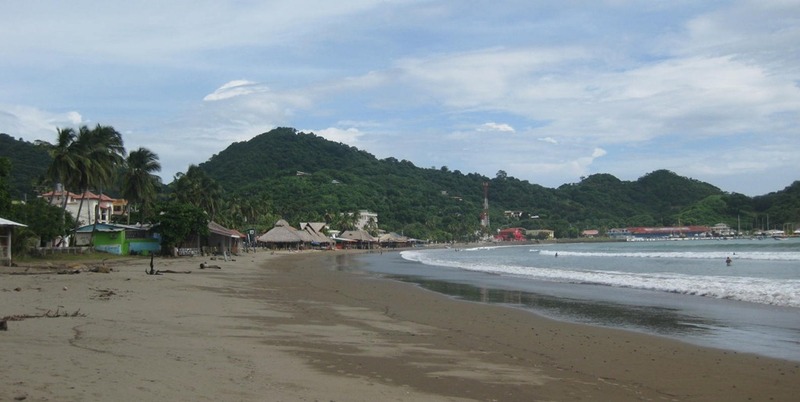 Penas Blancas seems to exist only to serve the “needs” of those crossing the border with Costa Rica. It’s more than a tad seedy, very busy and confusing. When we exited the taxi, we were immediately handed 2 immigration forms and asked to pay $1 each which I think is a fee levied by Penas Blancas. We then had to clear a checkpoint where our passport and immigration form were glanced at and asked to pay another $1 each for exit from Nicaragua. As an aside, I would also mention that there were long lines of semi-trucks with trailers waiting on both sides of the border. Apparently, the process for them to clear is quite time consuming. We explained how we got to the island and a little about Finca El Porvenir. In addition to the natural beauty of this island, there are petraglyphs located around various parts of the island but many are in the area of El Porvenir. These stone carvings depicting humans, animals, birds and other geometrics shapes are courtesy of the Chorotega settlement dating back to around 300 B.C. Here are some samples along with some other photos. To locate on the map where we stayed, if you see the road crossing the isthmus right along the coast, take a right at Santa Cruz and El Porvenir is about 1.5km along that road. 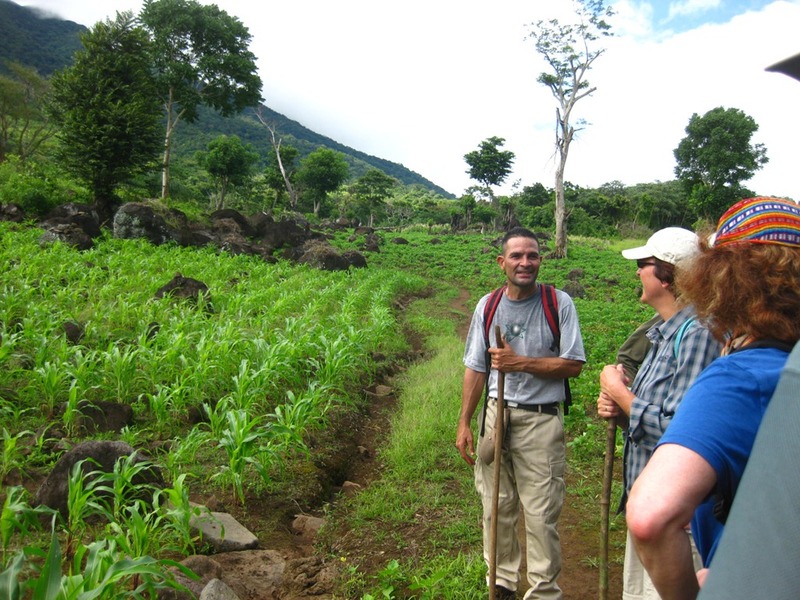 El Porvenir is also the primary point at which to begin a hike up the Maderas volcano. We were able to join a group that was setting out to hike to the top. The group consisted of a local guide, 2 ladies from Germany and 1 lady from Holland. Valerie and I weren’t prepared to hike to the top (about 5,000 feet elevation gain, we hadn’t prepared lunch and perhaps not quite fit enough) but the guide agreed to have us join them to the viewpoint, which is about halfway up. He said that he could have someone bring us back down to El Porvenir. The hike to the top is generally an 8 hour round trip. To the viewpoint is a 3 to 4 hour round trip. 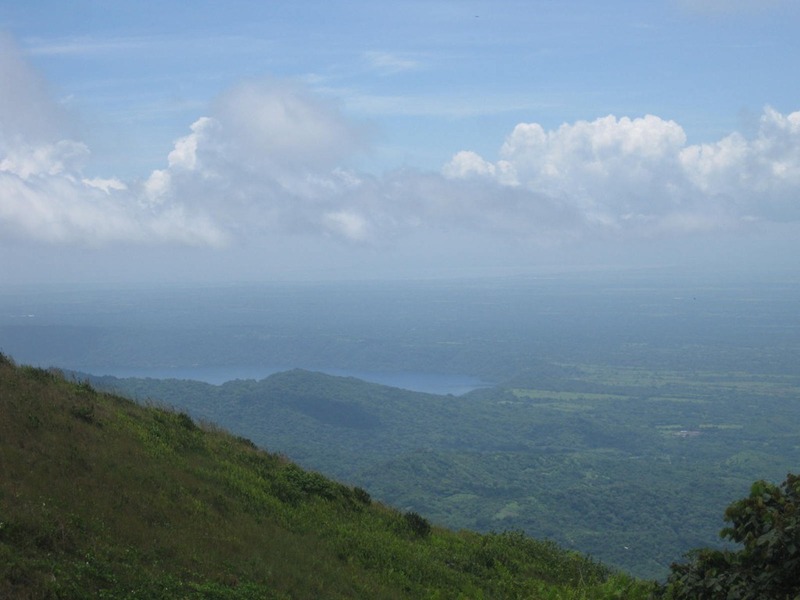 An island formed by twin volcanos, side by side, rises out of Lake Nicaragua. The two volcanoes are Concepcion which rises 1610 meters above the lake in an almost perfect cone and Maderas at 1394 meters. Lava flows created the isthmus which joins the two volcanoes to form the island. 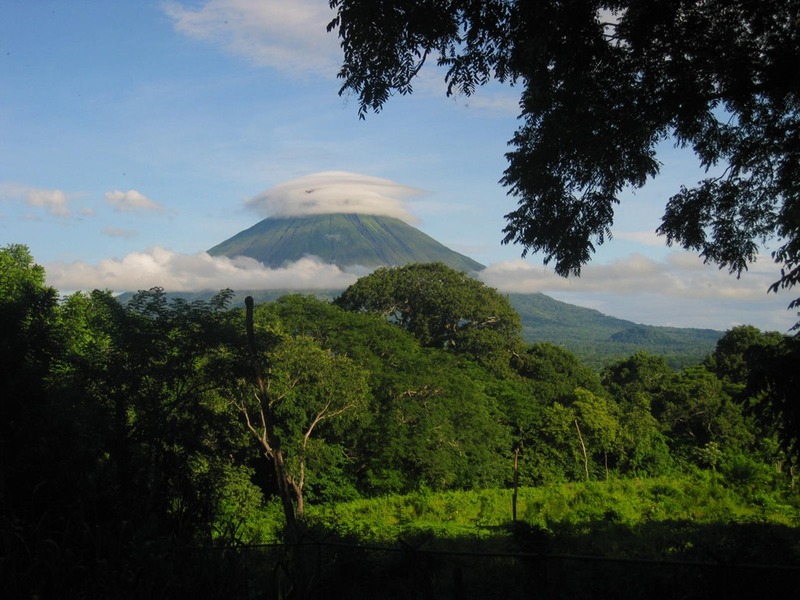 Ometepe is a ecological jewel that is still very unspoiled, a rough and ready sort of place with shocking roads and lots of plant and animal diversity. 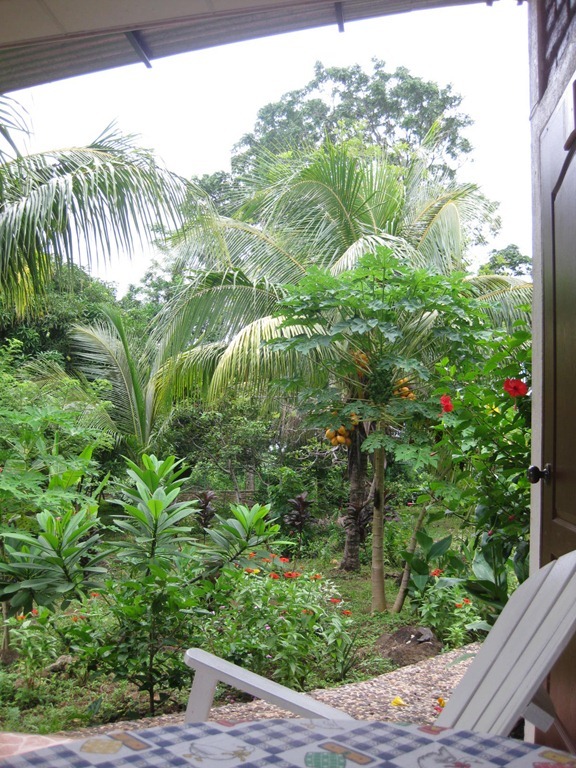 On the Maderas side of the island we stayed at Finca el Porvenir, a very charming place with 3 or 4 separate buildings set among a stunning garden with lush flowering plants, mango trees, shrubs and coconut palms. Mixed in is a variety of wildlife including an abundance of butterflies, several types of birds, squirrels, pigs, lizards, dogs and plenty of insects. Our room, which has a front porch with rocking chars and hammocks is small but nicely appointed with a sturdy wooden frame bed and a bathroom with walls covered in smooth river rocks. The Mombacho volcano towers over the city of Granada along the shores of Lake Nicaragua. It tops out at 1345 meters, dwarfed by the volcano peaks we saw along the Andes in Ecuador. However, the steep slopes form an island of biodiversity. Vegetation and wildlife vary with elevation and above 800 meters the volcano becomes a cloud forest with bromeliads, ferns and mosses clinging to the trees. Most days the upper reaches of the volcano are obscured by cloud cover but on the day we visited, we had cloud free views from the mountain.